It has been nearly four decades since the United States government mandated the use by federal agencies of the terms “Hispanic” or “Latino” to categorize Americans who trace their roots to Spanish-speaking countries, but the labels still haven’t been fully embraced by the group to which they have been affixed. Only about one-quarter (24%) of Hispanic adults say they most often identify themselves by “Hispanic” or “Latino,” according to a new nationwide survey of Hispanic adults by the Pew Hispanic Center, a project of the Pew Research Center. About half (51%) say they identify themselves most often by their family’s country or place of origin—using such terms as Mexican, Cuban, Puerto Rican, Salvadoran or Dominican. And 21% say they use the term “American” most often to describe themselves. The share rises to 40% among those who were born in the U.S. When the U.S. Congress passed Public Law 94-311 in 1976 requiring that federal government agencies categorize and collect data on Hispanics, it was the first and only time in the nation’s history that an ethnic group had been singled out in this manner (Rumbaut, 2006). Government agencies also collect data on whites, blacks and Asian-Americans, but unlike Hispanics they are all categorized by the U.S. Census Bureau as racial groups. Hispanics are categorized as an ethnic group—meaning they share a common language, culture and heritage, but not a common race. However, the Pew Hispanic Center survey finds that the government’s system of ethnic and racial labeling does not fit easily with Latinos’ own sense of identity. For example, when asked which term they prefer, “Hispanic” or “Latino,” half (51%) say they have no preference for either term, while 33% say they prefer Hispanic and 14% say they prefer Latino. When asked whether Latinos in the U.S. share a common culture, just 29% of Latinos agree. Fully 69% say Latinos in the U.S. have many different cultures. And when asked to state their race in the Pew Hispanic survey, while a third (36%) call themselves white, a quarter (26%) say they are “some other race” and another quarter (25%) volunteer that they are “Hispanic or Latino” (even though the U.S. government doesn’t treat those labels as a race). Just 10% say their race is black, Asian or mixed race. By comparison, on the 2010 Census form, 53% of Hispanics checked white (see text box for more explanation about these categories). The survey also finds Hispanics are divided about the degree to which they feel a common identity with other Americans. Some 47% say they think of themselves as “a typical American” while an identical share say they think of themselves as “very different” from a typical American. These responses vary sharply by immigrant status. Among foreign-born Hispanics, 34% think of themselves as a typical American; among the native born, 66% do. Hispanics are the nation’s largest minority group. At more than 50 million strong, they make up 16% of the U.S. population now, and by some projections, that share will rise to nearly 30% by mid-century (Passel and Cohn, 2008). Among Latinos ages 18 and older, some 52% are immigrants and 48% were born in the United States. Among Latinos of all ages, 63% are native born and 37% foreign born. Race and ethnicity are familiar ways to categorize groups of people, but they also can be a source of confusion. The federal government’s definitions may differ from the way people describe themselves or how they think about these terms. The government also classifies people according to five major racial groups—white, black, American Indian or Alaska Native, Asian, and Native Hawaiian and Pacific Islander—and any combination of races. It is based on people’s origins from a particular region of the world. When filling out census forms and other government documents, people are allowed to select their own ethnicity and race, or multiple races. Because Hispanics are classified as an ethnic group but not a race, they can face particular challenges. The 2010 U.S. Census form, for example, had two identity questions. 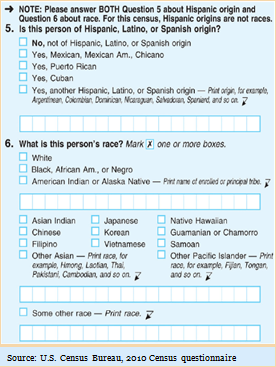 The first asked if a person is “of Hispanic, Latino or Spanish origin.” In its directions, the form explicitly notes that “For this census, Hispanic origins are not races.” Next it asked the person’s race and provided 15 possible boxes to check. None of the boxes is Hispanic or Latino or any of the Hispanic origins listed in the Hispanic origin question. One option, however, is “some other race”—a default for people who do not identify with any of the other options. Results from the 2010 Census indicate that among self-identifying Hispanics, fully 37% selected “some other race” and an additional 6% selected two or more race boxes, one of which could be “some other race.” (A majority of Hispanics, 53%, selected white and 3% selected black.) By contrast, among non-Hispanics, less than 1% checked “some other race” and just 2% selected two or more race boxes (Humes, Jones and Ramirez, 2011). Latinos have many different ways to describe their identity—including pan-ethnic terms like “Hispanic” or “Latino,” or the term “American,” or terms that refer to their family’s country of origin. Their choices vary among different Latino subgroups, with nativity and language usage the strongest predictors of identity preferences. Among first-generation (or immigrant) Hispanics, more than six-in-ten (62%) say they most often use their family’s country of origin to describe themselves. Among second-generation Hispanics, the share using their family’s country of origin falls to 43%. And among third-generation Hispanics, the share falls to just 28%—less than half that seen among immigrant Hispanics. Not surprisingly, the use of the term “American” increases in a mirror-image pattern. While just 8% of immigrant Hispanics most often call themselves American, that share rises to 35% among second-generation Hispanics and 48% among third-generation Hispanics. Use of the pan-ethnic terms “Hispanic” or “Latino” to describe identity also varies across generations, but the pattern is not as notable. Among immigrant Hispanics, 28% say they most often describe themselves as “Hispanic” or “Latino.” Among second-generation Hispanics, this share falls to 18%; among those in the third generation, it’s 21%. Across other subgroups of Hispanics, the less educated and Spanish dominant are more likely than the more educated and English dominant to use their family’s country of origin to describe their identity. More than six-in-ten Spanish-dominant Hispanics (63%) say they most often use the name of their family’s country of origin to describe themselves, and nearly as many Hispanics with less than a high school diploma (57%) say the same. By contrast, just 37% of the native born and one-third (33%) of the English dominant say they call themselves by the names of their ancestral countries. As noted earlier, use of the term “American” mirrors that of country of origin, in reverse. While Spanish-dominant Hispanics are most likely to say they call themselves by their family’s country of origin most often, just 4% say they most often describe themselves as American. Among Hispanics who have less than a high school diploma, only 10% say they most often use the term American. Meanwhile, 40% of native-born Latinos and 48% of English-dominant Latinos say they most often describe themselves as American. Use of “Hispanic” or Latino” is highest among Spanish-dominant Latinos (30%) and those with less than a high school diploma (also 30%). It is lowest among English-dominant Latinos at 16%. Expressions of “no preference” for “Hispanic” or “Latino” are widespread. Pluralities of all subgroups say they have no preference for either term. Even so, there is variation on this point. Expression of “no preference” is highest among Latinos who have at least some college education (59%) and among English-dominant Latinos (58%). Meanwhile, expression of “no preference” is lowest among Spanish-dominant Latinos (47%) and those who have less than a high school education (44%). Among those who express a preference, the term “Hispanic” is preferred over “Latino” by a large, often two-to-one, margin overall and for all subgroups. When it comes to racial identification, many Hispanics’ self-assessments do not fit into the racial classifications used by the U.S. Census Bureau and the federal government. Findings from the Pew Hispanic survey show that, when asked which term describes their race—white, black, Asian or some other race—51% of Latinos say their race is either “some other race” (26%) or volunteer that their race is “Hispanic or Latino” (25%). Meanwhile, one-third (36%) say their race is white and the remainder, 10%, identify their race as black, Asian or mixed race. The Pew Hispanic survey also finds that racial identification among Latinos varies by immigrant generation, with third-generation Latinos the most likely to identify as white. Among immigrant Latinos, 51% say their race is “some other race” (21%) or “Hispanic or Latino” (31%)2, 36% say their race is white and 9% say their race is black, Asian or mixed race. When asked whether they see themselves as a “typical American,” Hispanics are evenly split—47% say they are “a typical American” and another 47% say they are “very different” from a typical American. These responses vary sharply across demographic subgroups of Hispanics. Those who are more affluent, English dominant and U.S. born are most likely to call themselves a typical American. Among Hispanics who make more than $75,000 a year, 70% say they see themselves as a typical American. Among third-generation Hispanics, 69% say the same, as do two-thirds (66%) of English-dominant Hispanics and two-thirds of native-born Hispanics (66%). 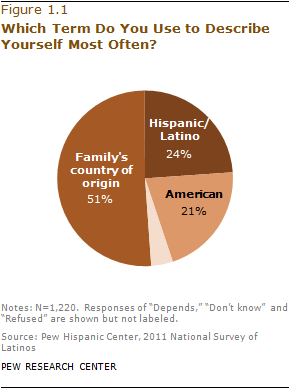 Shared Hispanic Culture among U.S. Hispanics—Or Not? By a margin of more than two-to-one across nearly all major demographic subgroups of Hispanics, more say U.S. Hispanics have many different cultures than say they share a common culture. For example, among college-educated Hispanics, 74% say U.S. Hispanics have many different cultures, while just 25% say they share a common culture. Results are similar among the foreign born (71% versus 27%), the Spanish dominant (70% versus 28%) and Mexican-origin Hispanics (67% versus 30%). Even among those who are U.S. born with U.S.-born parents, nearly twice as many say U.S. Hispanics have many different cultures as say they share a common culture—62% versus 36%. Findings from the Pew Hispanic Center’s survey differ from those of the 2010 Census for two possible reasons. First, the Pew Hispanic survey’s question about race is worded differently from that of the U.S. Census. 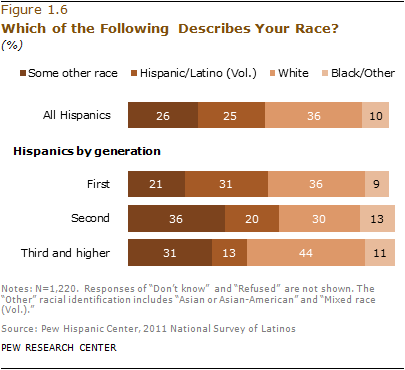 In the Pew Hispanic survey, respondents are asked “which of the following describes your race? You can select as many as apply: white, black or African-American, Asian or Asian-American or some other race?” By contrast, the 2010 Census form asked respondents “what is this person’s race?” offering 15 options. Among the options is the response “some other race.” Those who select “some other race” are asked to write in their race. (To date, the Census Bureau has not released a detailed tabulation of these write-in responses.) In the previous question, about Hispanic/Latino/Spanish origin ethnicity, an explicit direction is provided: “For this census, Hispanic origins are not races.” Neither “Hispanic” nor “Latino” or Hispanic origins is listed as a response option in the 2010 Census form’s question about race.